So, I’ve missed 8.5 days of work so far. Beginning Tuesday, two weeks ago, I began calling in sick to work, feeling sick as a dog, hacking up a lobe of my lungs now and then, and feeling pretty hazy due to medication. I was feeling a touch better this week, so I went in for a half day at work on Wednesday, hoping to get caught up on some really overdue stuff. Like, launching a website that should’ve launched long ago by now. Then I went to church and taught my final class on “Heaven and Hell.” By the time class was over, I was drained (as always after being exposed to more than two people for an hour! ), but still feeling pretty good. I had some powerful cough drops, so I wasn’t wracked by a single coughing bout all night. I got home, roughed up the kids a bit, sat with my girl until she got drowsy, and slipped into my boy’s room for our ever-growing nighttime rites. After, as we cuddled and I waited for AJ to doze off—and stay that way—I started getting chilly. I never get chilly. Even when it’s freezing and snow is blowing. I’m either hot, or cold. Rarely, if ever, simply chilly. So I went downstairs and sat with Jennifer on the couch. I knew I was sick when I actually asked her to sit closer because I was cold. Then I got my heavy leather coat and started using it as a throw. Okay. Call the paramedics. Hell is freezing over. Next day Jen drives me in to the doc’s office, I do the usual weigh in (nothing lost, nothing gained), BP cuffs (good pressure), thermometer (still feverish), stethoscopes (check out this good pediatric stethoscope review), lights, chest x-rays (what? x-rays? ), and then wait for the doc. I think he missed my irony. I like to be ironic. Irony in the face of lung-crippling death strikes me as cool. But staying alive is even cooler, so I listened without comment after that. Apparently, most people don’t really “catch” pneumonia—unless you just happen to inhale when someone sneezes down your throat. Normally, my doc tells me, it’s a simple matter of inhaling bacteria already present in the mouth, nose, or throat. For famous roof-raising sleep-apneac snorers like myself, it’s a wonder this doesn’t happen more frequently. Any time I doze off without my CPAP device I’m going to wake up in a coughing, sputtering lung-spasm. Guaranteed. By the doctor’s orders, I am to stay home all next week. Oy. I’m warned not to pay attention to the feeling of well-being that comes after taking the antibiotics, I probably worsened my condition by working and teaching last week: the combined efforts weakened me enough that the pneumonia got a good rush at my defenses. Fortunately, I’ve got the doc on my side now. Unfortunately, he ain’t doing my work for me. My cubicle will be sad and lonely without me. I suspect co-workers won’t be either sad, or lonely, but many will be frustrated. Line up behind me, please. Plus, the thought of the work time lost is driving me crazy. If it occurs to you, say a prayer for me. I want to get caught up at work as quickly as possible after my return. I will need to work hard, without inviting a relapse. My brother died of a heart attack at 55, but I remain convinced in my own mind that his bout with pneumonia not too many years previously set the stage for that event. Take care of yourself……. Please touch Rich and restore him to good health. Remove the pneumonia and keep it in the past. May You, Lord, receive the glory from this. Your mother-in-law is glad you’re taking this seriously…I can’t imagine our life without you in it. You are a gift from God to our daughter, our grandchildren and to us. Because I know your work is important toyou, I was so afraid that you would try to go back too soon. Thank you for taking the time to recover. I love you and I want you well! Thanks, Jackie. I appreciate it. I love you, too. I am intrigued by your pneumonia article. I’m in the middle now of my second bout of pneumonia in 4 years. I thought initially that I just had the flu but when my symptoms worsened I saw a doctor who all but confirmed (the xray office was closed due to the holiday) that it was pneumonia. Here’s why your article intrigued me. 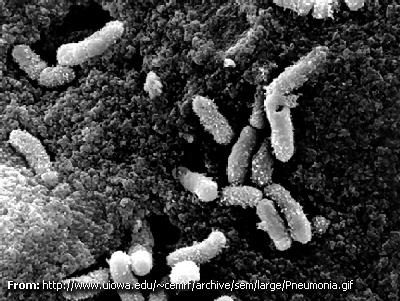 You mentioned that …there’s a correlation between inhaling the bacteria and getting pneumonia. Ironically, I’ve also suffered crhonic sinusitus and had two serious nasal surgeries for incessant nosebleeds. I have had a bad habbit of taking these huge snorts/inhales in lieu of blowing my nose(pardon me) to loosen the mucus (the inverse of a hawk spit i suppose) and I almost certain this is how this crap is entering my lungs. I will try to break this habbit immediately. besides it’s gross anyhow. Thanks for sharing your pain with us it has helped me. BTW, thanks for teaching I’m a former teacher and now I’m a Resident Principal, @ W.E.B.DuBois HS in Baltimore, MD. Hi, Kirk, I never really thought when I wrote that post lo these many moons ago that it would prove helpful to anybody! But, hey, I’m glad it did. I agree with you â€” the lost art of blowing one’s nose needs to be revived! Not that I’m an advocate for carrying hankies or snot rags everywhere, but I do make it a point to always keep some tissues or napkins in my car now and I try to blow my nose more often rather than hawking my nasal wares.